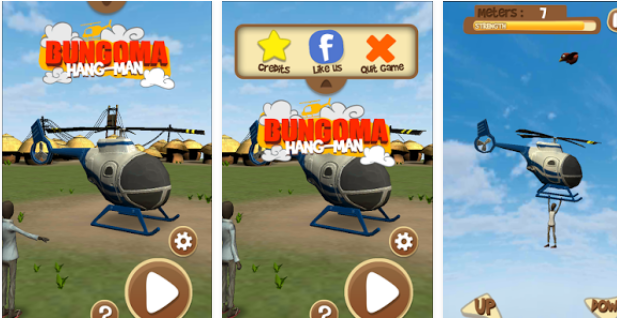 Creative Kenyans develop Bungoma Hang-man game – Kenyatta University TV (KUTV). All Rights Reserved. It was a free drama from a stupid action to watch when the daring Saleh Wanjala hanged on a chopper that had ferried the body of the fallen billionaire Jacob Juma at Posta ground in Bungoma town. Seeing the incident, many jokes were made with some claiming that he was getting back a thermos full of tea with others joking that Mr Wanjala confused the sound of the helicopter with Posho Mill yet he had brought with him maize for milling. But two computer IT young men took the incidence positively and immediately decided to develop a game by the name “the Bungoma hang-man”’ and unexpected happened; the game was a hot cake. The game which is available in google play store for android has simple instructions hence simple to play. According to the developers, you only need to keep yourself in space by avoiding hitting aerial materials, birds and electricity poles. However, the fun of the game is not flying, but the source of “fuel” for the helicopter man. When you are tired, you replenish your health by picking plates of Ugali, kuku (chicken) and Sukuma wiki.Unfortunately if your android version is not 4.1 and above it will not be compatible with your device.